For the second year running, the Cinque Terre National Park has announced that they will offer free guided hikes for Cinque Terre Card holders (that’s the National Park’s all-inclusive pass that I talked about here). For those without the Cinque Terre Card, a minimal fee is requested (which, to be honest, is a steal at just €2.50 per person). Do the math to see which option works best for you and your plans for the day. I know Chiara, the guide, personally and I’ve received great feedback from those that have hiked with her. Plus, she gets bonus points because she speaks English and she’s a bona fide local Riomaggiorese. Below you’ll find the schedule for the months of March and April (don’t worry, as the schedules for other months are released I’ll be sure to post them). Disclaimer: The flyer is not my own, so please don’t credit me with the grammatical errors and typos. You’ll want to reserve your spot at least a day or two in advance by sending an email to the address listed or ringing the number provided. Keep in mind these are hikes so proper footwear, a bottle of water and decent athletic abilities are recommended. 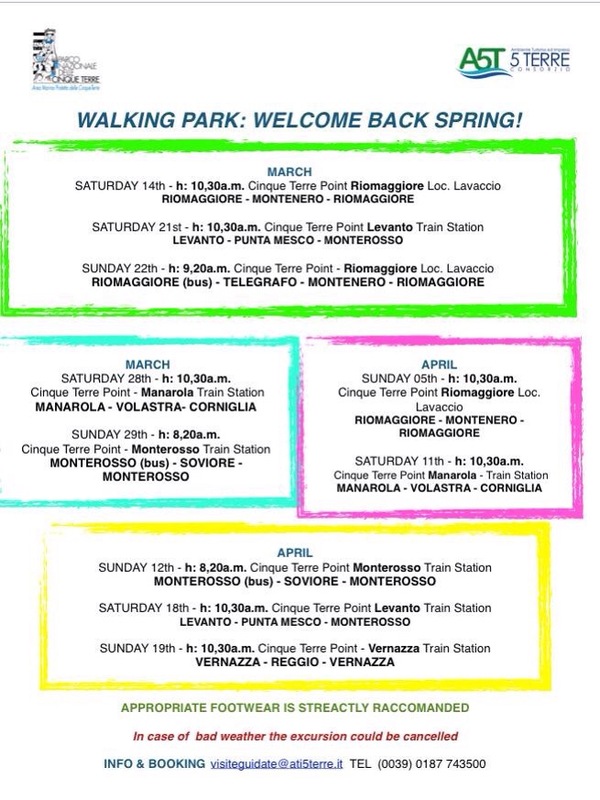 Further into the season the park will also offer guided tours of the Cinque Terre villages themselves (which is great for those not wanting to break too much of a sweat while they’re here).